Derwent Art Supply Company is a British company that has been creating pencils for artists since 1938. Its pencils were used in the production of the animated classic The Snowman, and it now produces over a million pencils a week. Derwent prides itself on coming out with innovative artistic tools, such as its Inktense painting pencils. If you've worked with Derwent products before, you may be in for a surprise: there is a significant difference between Derwent's Inktense and watercolor pencils. When you add water, Inktense produces ink, not watercolor paint. Once this has dried, the ink is waterproof rather than remaining water-soluble. This means you can add layers to your painting without disturbing what you've already done. This can be a big plus for those who enjoy adding to the surface a painting without reactivating what's underneath. That said, it's important to note that if you don't 'activate' all the Inktense pencil the first time you apply water, you may have some pencil left that will dissolve the next time you apply water. It depends on how heavily you applied the pencil and how much water you use. As with all water-soluble pencils, you can put a wet brush onto an Inktense pencil or stick to pick up some ink and then brush this onto paper. It's also possible to produce very painterly mark making by dipping the tip into the water and then drawing onto paper with it, and by working with the pencil into still-wet paint or damp paper. 72 Inktense colors in pencils, each with a reference number and name. 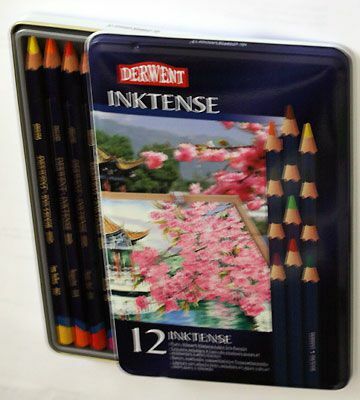 Inktense pencils and blocks sold individually or in tins of six, 12, 24, 36, or 72. Additional elements include Derwent's Outliner Pencil and Pencil Extenders which add length to a stub so you can work with it comfortably. For Inktense sticks, there's a rubber Gripper which slides over the stick to make it easier to hold and stop you getting ink on your fingers. A Grate n Shake is effectively a small grater with a container underneath for shredding bits of a stick, which you then shake onto wet paper or add to water to create larger quantities of ink for painting. Grate more than one color at a time to color mix. The colors in Inktense are decidedly strong and intense and go onto paper readily, so try them in your sketchbook before you put them onto an important painting. Otherwise, you may find yourself with too much, and dabbing it off with a cloth or trying to erase it. Both work, and will a little practice you'll soon get a feel for how much you need to apply. Inktense​ products are available either as pencils or as sticks. If you want to do detail, then the pencils are idea because they sharpen to a fine point and can give a very crisp line. If you want to work larger or without stopping to sharpen a pencil, the sticks are larger bits of the "lead" without the wood coating. Both go on easily, gliding across the page. You don't have to scrub at the paper to put down color. 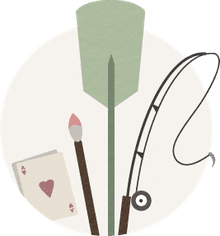 What Is Mixed Media Painting?